It's finally here! Super Mario Run has just been officially released to Android phones and tablets, and we have a download link for it. Hopefully a mod will be available soon so you can enjoy the game eve more! Remember though; There are many Super Mario Run Hacks out there on the internet, but all of them are fake and have malware with malicious intent to your data, so make sure you know what's you're installing. We only release real games, so when Super Mario Run MOD APK (no survey) comes out, you will be able to download it as usual. If not a mod, we will provide a Premium Full Version Unlocked as a way to keep you from spending unlimited money on micro transactions. But as usual we encourage you to support the devs if you like what they make! 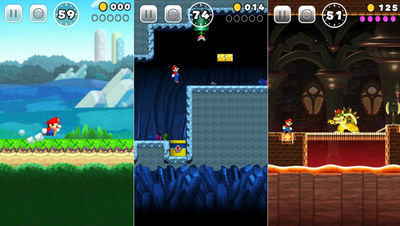 As to the gameplay, SMR follows the same mechanics as all Super Mario games that came before it on other consoles and mobiles. It's a platforming adventure where the protagonist, the famous Marios Bros, moves, runs, and jumps through many dangerous levels filled with creatures and unlimited coins to collect. The controls are one-tap easy so you can focus more on having super fun!! The story also follows the previous entries. Super Mario, the hero that he is, will try to rescue Princess Peach from Bowser’s clutches using all his powers and agility. He will travel through 6 unlocked worlds of castles, caverns, Ghost Houses, airships, etc and through more than 24 levels to save his beloved. Super Mario Run brings the new Toad Rally gameplay mode (requires Rally Tickets), where you can show off Mario’s stylish moves, compete against your friends and challenge people from all over the world... You can also perform stylish moves to fill up your gauge and launch into Coin Rush! Kingdom Builder, with over 100 kinds of items, is another mode where you gather coins and Toads to build your very own kingdom, with buildings and decorations that you acquire with the help of Toads gathered in Toad Rally. Note: To play Mario on Rooted Phones you will have to temporarily hide Root. To do that download MAGISK and hide your Root then play your game. This is the official game, No BS, NO SURVEY, NO ROOT! when is going to available the unlocked levels? @Alma Fernandez , since its an online game, its a bit difficult to hack! but im hopeful an unlocked version will be available soon! Link is not working. Is the game still available? there is a new update! but i received DMCA complaint so i removed link, and stopped updating the game! Maybe Ill start updating it again soon!! how long do we have to wait yet?